If you want an M4V converter, then you know that you have already made the right choice by coming to this site. We have listed a range of information about M4V converters as well as some information that will help you to make your decisions easier so that you can count on us to provide you with everything you need. 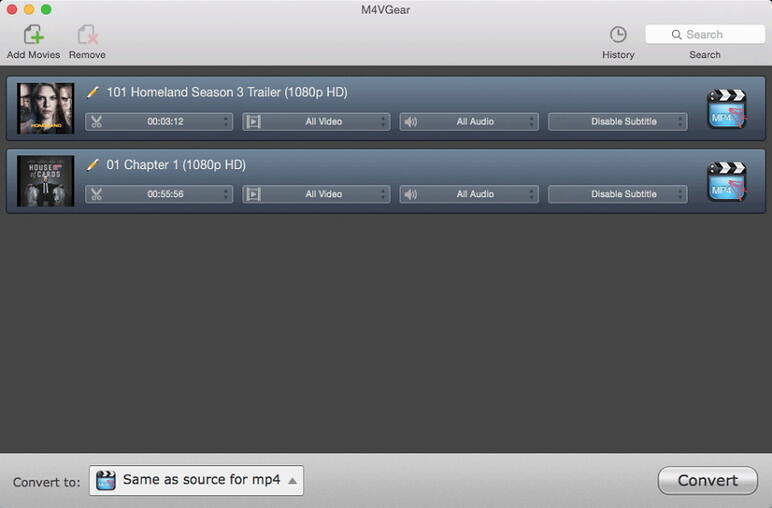 M4V file format is a video container that Apple developed. It is very similar to the MP4 file format, but is occasionally protected by DRM copy protection. This means that to play a protected M4V file, the computer has to be authorized via iTunes with the account that was used to purchase the video. On the other hand, if the M4V file is not protected, the actually can be played by other video players by changing the file extension, but only if it is converted to another format. This is extended from iTunes video format, developed by Apple, and therefore, like many products in the suite of Apple devices, has a very unique appeal. M4V files tend to be the best format for Apple devices, but for other players, you may find that you need to convert the files. Or, if you are not using a device with your particular iTunes account, you may also need to convert the files. If you have purchased lots of M4V files, you may need to convert them. So how do you find the best M4V converter? What's a good M4V converter? The best converters can convert DRM M4V videos, whereas many other converters cannot. However, you will also need to convert video files and save them as MP3, WMA, M4B, AAC, and so on. Additionally, it needs to be compatible with your devices. Convert Virtually Any Format - AVI, WMV, MP4, MOV, M4V, MTS/M2TS, AVCHD, DVD, VOB, MKV, MOD, TOD etc. 30X Conversion Speed - Much faster than other converters and with Lossless Quality Conversion. All-in-1 DVD Solutions - Convert/Copy homemade DVD for personal use and Burn video to DVD. Enjoy Your Media on Any Device - Convert videos to play on your tablet, smartphone, TV and more with 4K UHD support! Support basic editing functions - Trim, adjust, merge, crop, rotate videos, add watermark, subtitles etc. Download YouTube vidoes and playlist - Download online videos from YouTube and other 10,000 sites. More tools - Record videos, fix metadata info, make gif and more. Addtionally, this M4V converter works on Mac and PC, comes in 8 different interface languages, and has been downloaded over 6 million times. Wondershare also protects against piracy by prevention copying of protected material. Best of all, it is free! With this M4V Converter, it is to convert m4v to AVI, ASF, MP4, MOV, FLV, DivX, Xvid, MPEG1, MPEG2, MKV and even HD video formats like MOV HD, ASF HD, AVI HD, DivX HD, H.264 HD. Remove unwanted video playing region with exact top, bottom, left and right values via the editing features. Batches of AVI video files can be inserted into AVI Video Converter, drag and drop is supported. The software also allows you to save output converted video files to any folder on local computer. Pause and stop m4v conversion at ease. Video Brightness, Contrast and Saturation can be adjusted freely to the best effect. Although this download is free, you get what you pay for. It’s only compatible in English with Windows 7, making the versatility limited. It’s available in 8 different languages, but each copy is almost $50! There are certain limitations with this, although it’s pretty affordable for paid converters. Any Video Converter Pro is a little more affordable, with pretty much the same benefits. You can purchase it for about $40 and convert DVDs, CDs and videos to various formats like AVI, WMV, MP4, MPEG-1, MPEG-2, FLV, SWF, MKV, WMA, MP3, 4K HD videos and etc. for devices such as iPhone (iPhone 6s/6s Plus), iPad (iPad Air, iPad Pro, iPad mini 4), and other devices like Android phones (Samsung Galaxy S6, Note III, HTC, Sony Experian Z2), Windows Phone, PSP, Xbox One and so on. However, it’s compatible with windows over apple, which really limits its functionality. Noteburner M4V Converter Plus is another paid windows product. It offers a lifetime version of technical support and updates, and protects against piracy issues because Noteburner M4V Converter Plus is an excellent M4V DRM removal tool for Windows users to remove M4V DRM. With this DRM M4V Converter, you can legally remove DRM from iTunes M4V so that you can enjoy iTunes movie on non-apple device without iOS restriction. However, you have to purchase a separate version for Mac, and since it’s almost $50, you lose some versatility here. Out of these, Wondershare Video Converter Ulitmate is the best. Because of its speed and versatility, you get the most use out of this on any device. Plus, you don’t have to worry about downloading the wrong version and wasting a lot of money. And it protects you from risky piracy and copy right issues. Wondershare is by far the best M4V converter.